The European Economic and Social Committee (EESC) is a consultative body of the European Union (EU) established in 1958. It is an advisory assembly composed of "social partners", namely: employers (employers' organisations), employees (trade unions) and representatives of various other interests. Its seat, which it shares with the Committee of the Regions, is the Jacques Delors building on Belliardstraat / Rue Belliard 99 in Brussels. Once known by the acronym "EcoSoc", the body is now referred to as the "EESC", to avoid confusions with the United Nations ECOSOC. It was established by the Treaty of Rome of 1957 in order to unite different economic interest groups to establish a Single Market. The creation of this committee gave them an institution to allow their voices to be heard by the European Commission, the Council and the European Parliament. The EESC declares itself to be "a bridge between Europe and organised civil society". It is mandatory for the Committee to be consulted on those issues stipulated in the Treaties and in all cases where the institutions deem it appropriate. The Treaty of Maastricht considerably enlarged the Committee's domain. Its influence now extends to matters such as social policy, social and economic cohesion, environment, education, health, customers protection, industry, Trans-European Networks, indirect taxation and structural funds. On certain issues the EESC works in partnership with the Committee of the Regions. Boosting the role of civil society organisations in non-member countries or country groupings where the Committee is furthering structured dialogue with civil society organisations, and promoting the creation of consultative structures based on its experiences, not least in the countries applying for EU membership, the Mediterranean partner countries, African, Caribbean and Pacific countries, India, China, Latin America (Mercosur) and Brazil. It is mandatory for the Committee to be consulted on those issues stipulated in the Treaties and in all cases where the institutions deem it appropriate. The EESC may also be consulted on an exploratory basis by one of the other institutions, and may issue opinions on its own initiative (around 15% of its opinions are own-initiative opinions). Own-initiative and exploratory opinions often raise the awareness of decision-making bodies, and of the Commission in particular, about subjects which have hitherto barely attracted their attention, if at all. Exploratory opinions drawn up at the request of other institutions before the Commission has even drafted its proposals enable the various components of organised civil society represented within the EESC to express the expectations, concerns and needs of grassroots stakeholders. The Committee adopts on average 170 opinions a year on a wide range of subjects concerning European integration. It therefore plays an active role in the processes of shaping Community policies and preparing Community decisions. Currently, EESC membership numbers 350 (same as the Committee of the Regions). The number of members per EU state varies according to the population of each state (see table below for state-by-state membership figures; the breakdown is the same for the Committee of the Regions). Members of the EESC are divided into three groups of equal number, employers, employees and a third group of various other changing interests such as: farmers, consumer groups, professional associations and so on. Members are appointed by the Council (by qualified majority) following nominations made by the government of the respective Member State. However, once appointed, the members are completely independent of their governments. They have a renewable term of office of five years. The President of the EESC, elected for a ​2 1⁄2-year term, is Luca Jahier (since 18 April 2018), and the previous presidents were Georges Dassis (2015-2018) and Henri Malosse (2013-2015). In a report reviewing 50 years of the EESC, C.S. Dimitrioulas cited Jacques Delors as saying that EESC contributions from 1958 to 2008 on civil and social matters were "remarkable". Dimitrioulas commented: "Thanks to its membership and unique role in the EU’s institutional framework, the Committee will in future have special responsibility for making a reality of participatory democracy and for working towards the development of structured dialogue between organised civil society and Union institutions." Critics observed that while the EESC has undoubtedly performed good works in its time, it has now outlived its usefulness and should be dismantled. The modern EU is replete with advisors: Commissioners have their DGs, MEPs have their own researchers, and the ad hoc national ministers attending the Council of Ministers have both their own advisors and the services of COREPER. The vice president of the European Conservatives and Reformists group in the European Parliament, Derk Jan Eppink declared, "Over the last eight years, the budgets of the EESC and CoR will have increased by some 50 percent, reaching €130 million and €86.5 million, respectively. There are around 50 officials at each committee with a minimum salary of €123.890, and six officials at each committee earning over €180,000 " He stated that there is no information on whether or how the COR and the EESC opinions had influenced legislation, adding that neither Committee had been successful in fulfilling its mandate to "engage participation" from citizens. Far from being sidelined as critics hoped, the EESC has been reinvigorated by the Lisbon Treaty, which has confirmed the EESC's role and influence. According to proponents of the EESC: "Indeed, significant prospects for the development of participatory democracy are opened through Article 11 of the new Treaty on the European Union, which lays the foundations for the future establishment of a genuine structured civil dialogue at European level alongside the political dialogue between the EU and its Member States and the social dialogue with the social partners, thereby ensuring sustainable participation of organised civil society in the European political process. In this context, the EESC has a particular responsibility in bringing participatory democracy to life. In view of its membership and role, as laid down in the Treaties, and in partnership with the other institutions, the Committee's purpose is to be even more in the future the means of developing participatory democracy and civil dialogue at Union level." ^ "Secretary-General - European Economic and Social Committee". European Economic and Social Committee. ^ "The President - EESC". Retrieved 2018-05-17. ^ "Former EESC Presidents". Retrieved 2018-05-17. ^ a b The European Journal. "The EESC and COR should be abolished". europeanfoundation.org. ^ "EU advisory committee defends its role against critics". EurActiv - EU News & policy debates, across languages. 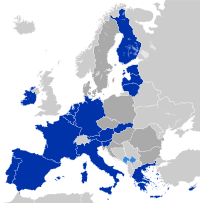 Wikimedia Commons has media related to European Economic and Social Committee. This page was last edited on 4 December 2018, at 16:08 (UTC).